Experience is a dear school, but it is the only one we are apt to learn in. 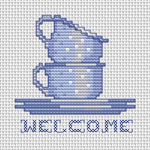 Cross stitch design of blue tea cups. Designed for White Evenweave. An abstract tropical island with the sun shining above. 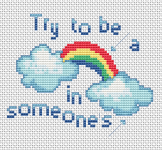 Simple cross stitch pattern of flowers with the text: "Happy Birthday". 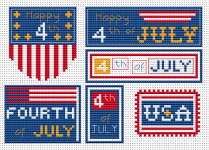 Set of six American-themed patterns.Independence Day of the United States, also referred to as the Fourth of July. 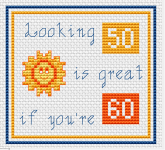 Funny birthday card of the sun smiling and the text: Looking 50 is great when you are 60. 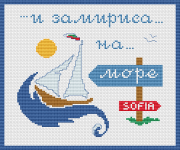 Summer,vacation,sun,Black Sea..A cross stitch pattern based on a popular Bulgarian song from the past. 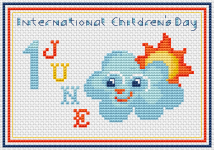 June 1st was proclaimed to be the International Children's Day in 1925. 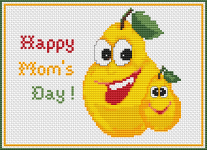 Cute pattern of yellow pears, celebrating Mother's day.